Farrah in her young, show girl days. Note her black markings are fairly light. Depending on the characteristics of the individuals, the varieties can be hard to tell apart without using a wicket (a judge’s measure) – both sizes are born into the same litters. Although a breeder can guess, based on family history, whether a puppy will grow to be 13″ or 15″, there’s no rule. Their future height may be obvious in some pups from as young as six months, but beagles can continue to grow until they’re two years old. The 13″ variety usually has less bone mass but in both varieties, the preferred dog is one with sturdy bone structure. This translates to a dog who should weigh between 20 and 30lbs depending on bone and muscle mass… and diet. Weight-watching is important, because beagles are ALWAYS hungry. Their table manners are those of the typical hound: if they can devise a way to get it, it’s theirs by right; it’s all part of the game. They won’t have a clue why this should upset you. Although they may be disappointed the “lead dog” (that’s you) is unhappy, they’re simply not going to believe it’s because you’d begrudge them a Christmas turkey! They strongly consider the last person to feed them, their best friend. Farrah in later years, happy on the sofa. 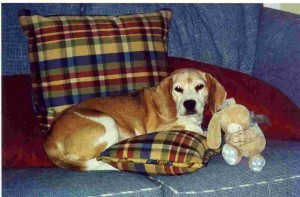 Beagles may have several color combinations. Tri-color (black, tan, and white) is the most common. Jackpot beagles are almost exclusively tri-color, although in the past we’ve had the occasional red-and-white. All color combinations may exhibit freckling or ticking (like “chocolate chips” scattered among the white bits, often on the legs), mottling (ticks on foot pads, and a lighter-colored or uneven-colored nose), and grizzling (mixed black or red and white hairs). The most common color combination is called tri-color. It means a black saddle, white legs, chest, and belly, with a tan head, and tan around the edges of the saddle. Many dogs have a white blaze on their face, but a solid tan face is common too. Tri-color puppies are born black and white – tan develops as the puppy gets older. When they age (as Farrah has in the photo above, left), the black saddle may fade entirely to tan. 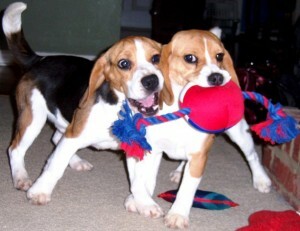 These beagles are still considered tri-color. There is no black on these dogs at all, and the red can range from a light tan to a darker red. These puppies are born as red and whites, or sometimes even a solid white, with the color developing later. 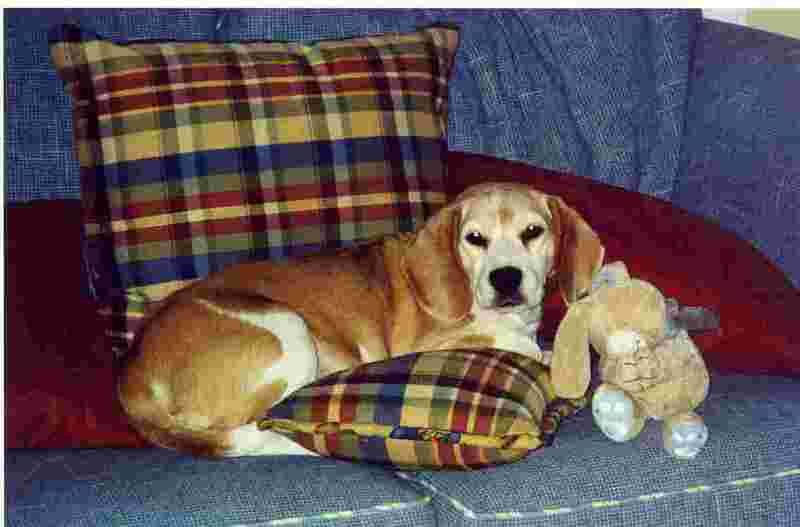 Tip: The National Beagle Club site has a detailed discussion of colors and sample photos. 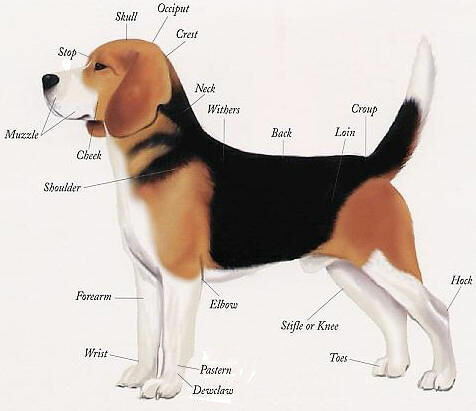 Beagles are scent hounds, bred to participate in a pack and to track prey over the countryside and flush it for hunters. This requires socially adept, outgoing, energetic, independent, creative, and sometimes stubborn dogs who devise, execute, and follow a plan to it’s conclusion. Smart and sharp, beagles are natural problem-solvers. For this reason, they’re often bored by trained acts they consider “repetitive” (like sit/stay) but we’ve seen them figure out how to move a chair to a counter, climb the chair, retrieve the steak from the counter, and take off with the loot! Some dogs are bred to “attach” to a single person but beagles consider everyone a member of their pack – a friend they haven’t yet met. That makes for easygoing dogs who (generally) welcome newcomers to the house but it has it’s limitations, too. Without stimulation from their ‘pack’, beagles will amuse themselves – and this can mean trouble. A beagle requires substantial playtime and attention. Beagles can do astonishing damage in short order! 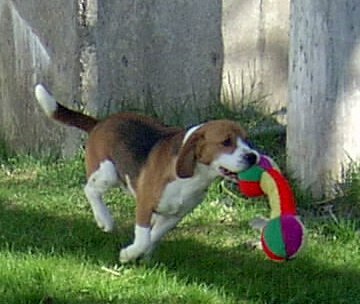 Beagles have loads of energy and are well-suited to those accustomed to regular exercise (on-leash only). Bred to run cross-country in pursuit of rabbits and foxes, they enjoy long runs and demand regular exercise. In rare cases, beagles can be kept in apartments, however, you must be extremely dedicated to taking regular walks, and it is not advised. On the other end of the spectrum, keep in mind that you should wait until the dog is at least a year old before (slowly) starting a prolonged running program of more than a mile per day. Talk to your vet for more information on running with your dog. Although they love the outdoors, Beagles do not make good ‘outside’ dogs because they need companionship. They need to be kept occupied and if regularly left in a backyard, will usually dig, bark, explore, experiment, and contemplate escape. If you are dedicated to walking in the morning before work and spending lots of time with them when you get home, your beagle should be able to spend an hour in a securely fenced yard. “Invisible” electronic fences will NOT work- beagles are far too curious and too devoted to “the hunt” to pay attention to (what they consider) minor corrections. 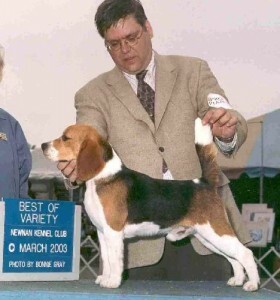 The Beagle’s independent and stubborn nature makes obedience training a necessity. Be sure to get into some kind of training routine early in your Beagle’s life. If you attend obedience classes, make sure your instructor understands the hound personality. Beagles require a firm trainer, but not a physical one. Beagles neither respect nor acknowledge physical force. Most owners keep their dogs inside when they’re unsupervised for long periods. Crates should not be used for over 8 hours at a time. Crate training is a suitable arrangement for short stays and during the night unless a sturdy, indoor/outdoor run can be arranged. In most cases, and for reasons including risk of theft, escape, or torment by neighborhood children and dogs, having a secure indoor place for your beagle is the best arrangement. Beagles, like all breeds, should be bred carefully and by knowledgeable people to help minimize hereditary disorders. That’s why we have a great number of beagles we can look to when we breed and why we stop breeding immediately if one member shows signs of a significant disease or disorder. That member (and his or her ancestors) simply “grows old” in our kennel and has a terrific life with the rest of the pack – but we never breed that line again. Cherry Eye — Very Common swelling of the gland of the third eyelid. Easily remedied with a simple procedure although they may require artificial tears in later years. Hypothyroidism — Very Common Dysfunction of the thyroid gland, causing numerous clinical signs including weight gain poor hair coat, reproductive problems and more.